Strolling along the streets of the borough of West Chester is like scrolling through a series of history lessons, each historic building adding a chapter to the unfolding story of the town’s rich past. Happily, West Chester can tell its long and interesting story through its collection of buildings because of the ongoing efforts of business owners, residents and government officials to preserve the Borough’s historic fabric. To encourage the continuing efforts to preserve the Borough’s unique character, the West Chester Downtown Foundation established a Historic Preservation Awards Program in 2010. Since the first preservation awards ceremony, 34 awards have been made covering buildings, preservation service, preservation legacy and special recognition. It was hoped that recognition gained through the awards would encourage further sound preservation practices. And it now appears that cycle has become well established. The Sixth Preservation Awards Ceremony continued the success of the program with eight more awards to add to the growing list. Nominations covered all three awards categories—Preservation Legacy, Preservation Service and Bricks and Mortar—plus, for only the third time, a Special Recognition Award was presented. The 2016 Preservation Legacy Award went to William Leo “Bill” McLaughlin of West Chester to recognize his “tireless, at times fearless, [advocacy] for the preservation of West Chester’s historic fabric” and his efforts to educate the public about the need to preserve the physical evidence of West Chester’s history. The Sharples Works, 300 East Evans St., won for both its innovative rehabilitation from a vacant, dilapidated industrial complex to a desirable 155-unit apartment complex and for its careful maintenance over the last 32 years. This project is one of West Chester’s first examples of adaptive reuse and remains one of its most visible. It is a showcase for creative solutions enhancing best preservation practices. Broadlawns, 601 North Church St., was recognized for ongoing efforts of its current owners to bring this 1881 T. Roney Williamson-designed house back to its original glory, while adapting it to modern use with a new addition that complements the house’s exuberant Queen Anne style. 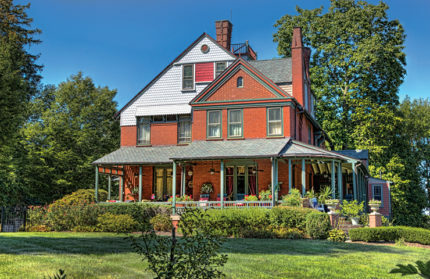 The continued stewardship of this neighborhood landmark significantly contributes to West Chester’s historic fabric. The Neiblum and Rosenberg Residence, 603 North Walnut St., (photo on prior page) won for the rehabilitation of this 1922 French Norman house that accomplished a complete restoration of the exterior and interior, while successfully addressing the need for modern conveniences, including state-of-the-art, energy-efficient mechanical and electrical systems. The project included structural repairs and demonstrates how a historic building can be reinvigorated while respecting historic character. The Lowe Residence, 424 North Matlack St., was selected for the successful rehabilitation of this 1859 Italianate house that married a complete restoration of the exterior with an updating of the interior. The project included the reconstruction of the building’s floor structure and rooftop widow’s walk. The efforts of the current owner and her design team returned this building to its original prominence as an anchor of Marshall Square Park. 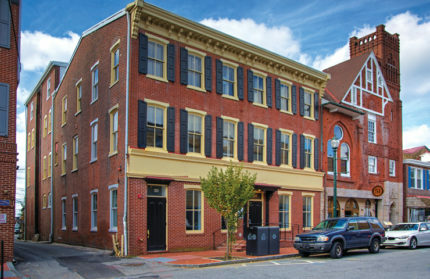 Synchrony Headquarters, 22 North Church St., won for the adaptive reuse of this c. 1845 commercial building that restored the interior and exterior while creating a headquarters building for a modern business. The project included restoring the loft and exterior hoist shaft and installing a new insulated roof system. This project demonstrates how historic properties can be adapted to new uses through sensitive historic preservation practices. The Seventh Annual Historic Preservation Awards kick off April 10 when nominations open and close June 9. For information, check the West Chester BID office and DowntownWestChester.com. The 2017 winners will be announced in July, and the Awards Ceremony will take place on October 19, 2017. Please help recognize the projects that enhance West Chester’s historic character and integrity by submitting a nomination!